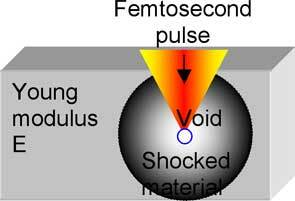 (Nanowerk Spotlight) Tightly focused femtosecond laser pulses have been used to modify transparent dielectric materials, to form voids, and to polymerize resists and resins for more than a decade. A high sub-100-nm spatial resolution has now been reached making it potentially a nanofabrication tool. However, the main focus has always been in analysing structural, morphological, optical, or chemical modifications. In the case of void formation in glasses and crystalline materials the heat propagation or self-focusing have been considered to be responsible for the phenomenon. In our study ("Laser-Induced Microexplosion Confined in the Bulk of a Sapphire Crystal: Evidence of Multimegabar Pressures"), we have focused on the physical description of light – matter interaction leading to void formation in the case of a single pulse irradiation. First, femtosecond laser pulse energy and duration were determined at the focus. The focal volume was estimated with high precision for the employed experimental conditions. The pulse power was kept lower than the threshold of self-focussing in sapphire (typically few-MW/pulse for most of dielectrics). Once the irradiance per pulse has been established the electron density created via multi-photon and avalanche ionization was calculated. The absorption of pulse energy within the photo-induced plasma was established using Drude model. The volumetric absorbed energy density, the pressure, was determined and reached several TPa (1012 Pa). It is noteworthy, that the electron – ion thermalization was established towards the end of the laser pulse due to high plasma density. This allows to determine the heating rate of material at the focus as the absorbed energy divided by pulse duration comprising a staggering 1018 K/s rate. Second, the material pushed out of focal volume was compressed into the shell surrounding the void formed at the centre. The thickness of this shell has been measured by electron scanning microscopy (SEM). 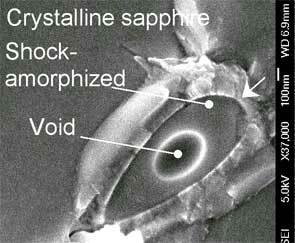 Sapphire compressed and pushed out of the central core was made amorphous and had an up to 10 -- 12% higher mass density. The amorphous phase of sapphire has been dissolved in aqueous solution of hydrofluoric acid while crystalline sapphire practically unaffected by the etchant ("Control over the Crystalline State of Sapphire"). The dependence of void and shock-affected diameters on the laser pulse energy has been established. The void and shock- affected regions smaller that the micrometer in cross-section can be formed. The understanding and interpretation of void formation has been reached on the basis of exclusively experimental data and the conservation laws of mass and energy. The extremely high pressure (several TPa) in the volume of sub-micrometer cross-sections has been created by absorption of femosecond pulse and, consequently, the strong shock wave has been triggered compressing surrounding sapphire of the Young modulus only E = 0.4 TPa. Applying the mass and energy conservation laws one can recover the energy density, i.e., the pressure and therefore the temperature, created inside the focus. We also performed the full simulation of all phenomena involved: laser focussing, absorption, plasma creation, formation of shock and rarefaction waves and high temperature plasma hydrodynamics that appears to be fully compatible with the measurements. Heating and cooling rates immediately follow from the laser parameters and measured size of a shock-affected zone. The shock-affected regions in the most inert, hard, and brittle wide-bandgap dielectrics used in UV optics might become processable after the structural and chemical alteration by a shock-wave. Channels for micro-fluidic applications can be formed, e.g., inside sapphire or quartz ("Femtosecond laser assisted etching of quartz: microstructuring from inside"). Such channels in transparent crystalline and glass materials are important for the miniaturized electrophoretic applications where movable ionic contaminants cause screening of an applied voltage. The other untapped application potential is in creation of nano-materials and new high-pressure phases of common crystals inside the shock-compressed regions inside host material. By Saulius Juodkazis (Associate Professor, Hiroaki Misawa Laboratory, Hokkaido University, Japan), Eugene G. Gamaly (Professor, Laser Physics Centre, Australian National University, Canberra, Australia), and (Head, Nanotechnology Research Center, RIES, Hokkaido University).